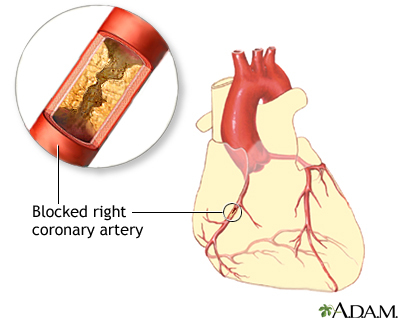 Hardening of the arteries, also called atherosclerosis, occurs when fat, cholesterol, and other substances build up in the walls of arteries. These deposits are called plaques. Over time, these plaques can narrow or completely block the arteries and cause problems throughout the body. 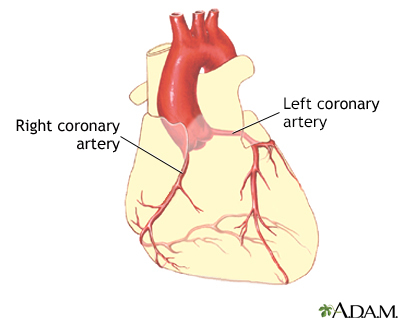 Hardening of the arteries is a common disorder. 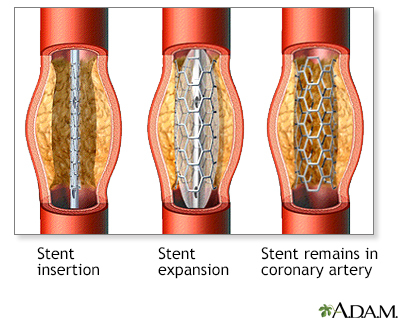 Hardening of the arteries often occurs with aging. As you grow older, plaque buildup narrows your arteries and makes them stiffer. These changes make it harder for blood to flow through them. 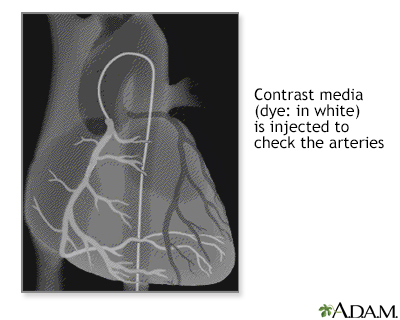 Clots may form in these narrowed arteries and block blood flow. Pieces of plaque can also break off and move to smaller blood vessels, blocking them. These blockages starve tissues of blood and oxygen. This can result in damage or tissue death. It is a common cause of heart attack and stroke. High blood cholesterol levels can cause hardening of the arteries at a younger age. 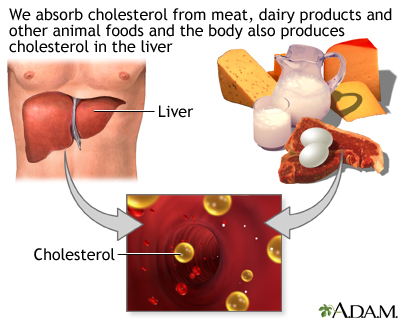 For many people, high cholesterol levels are due to a diet that is too high in saturated fats and trans fats. 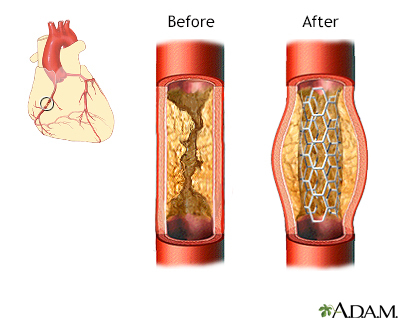 Hardening of the arteries does not cause symptoms until blood flow to part of the body becomes slowed or blocked. 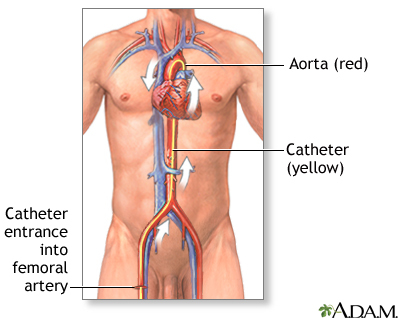 If the arteries supplying the heart become narrow, blood flow can slow down or stop. 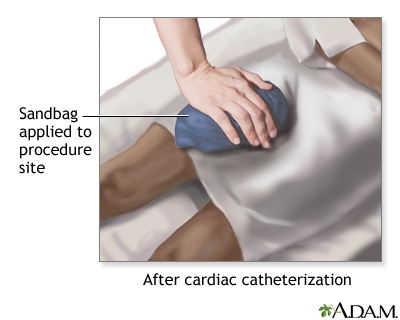 This can cause chest pain (stable angina), shortness of breath, and other symptoms. Narrowed or blocked arteries may also cause problems in the intestines, kidneys, legs, and brain. A health care provider will perform a physical exam and listen to the heart and lungs with a stethoscope. Hardening of the arteries can create a whooshing or blowing sound ("bruit") over an artery. All adults over the age of 18 should have their blood pressure checked every year . More frequent measurement may be needed for those with a history of high blood pressure readings or those with risk factors for high blood pressure. Cholesterol testing is recommended in all adults. The major national guidelines differ on the suggested age to start testing. Screening should begin between ages 20 to 35 for men and ages 20 to 45 for women. Repeat testing is not needed for five years for most adults with normal cholesterol levels. Repeat testing may be needed if lifestyle changes occur, such as large increase in weight or a change in diet. 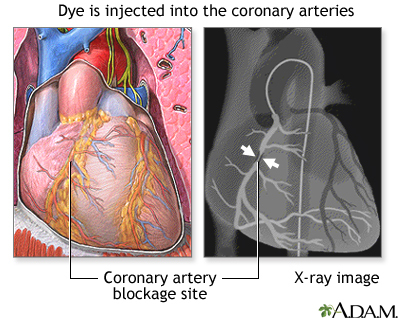 A number of imaging tests may be used to see how well blood moves through your arteries. Quit smoking: This is the single most important change you can make to reduce your risk of heart disease and stroke. Avoid fatty foods: Eat well-balanced meals that are low in fat and cholesterol. Include several daily servings of fruits and vegetables. Adding fish to your diet at least twice a week may be helpful. However, do not eat fried fish. Limit how much alcohol you drink: Recommended limits are one drink a day for women, two a day for men. Get regular physical activity: Exercise with moderate intensity (such as brisk walking) 5 days a week for 30 minutes a day if you are at a healthy weight. For weight loss, exercise for 60 to 90 minutes a day. Talk to your provider before starting a new exercise plan, especially if you have been diagnosed with heart disease or you have ever had a heart attack. If your blood pressure is high, it is important for you to lower it and keep it under control. Do not stop or change high blood pressure medicines without talking to your provider. Your provider may suggest taking aspirin or another medicine to help prevent blood clots from forming in your arteries. These medicines are called antiplatelet drugs. DO NOT take aspirin without first talking to your provider. Losing weight if you are overweight and reducing blood sugar if you have diabetes or pre-diabetes can help reduce the risk of developing atherosclerosis. Hardening of the arteries cannot be reversed once it has occurred. However, lifestyle changes and treating high cholesterol levels can prevent or slow the process from becoming worse. This can help reduce the chances of having a heart attack and stroke as a result of atherosclerosis. 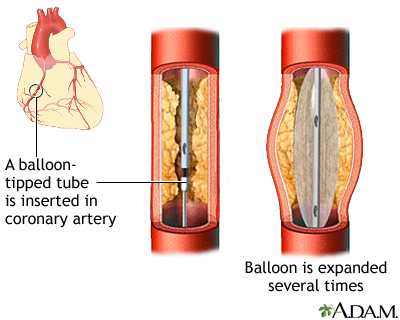 In some cases, the plaque is part of a process that causes a weakening of the wall of an artery. This can lead to a bulge in an artery called an aneurysm. Aneurysms can break open (rupture). This causes bleeding that can be life threatening. Libby P. The vascular biology of atherosclerosis. In: Zipes DP, Libby P, Bonow RO, Mann DL, Tomaselli GF, Braunwald E, eds. Braunwald's Heart Disease: A Textbook of Cardiovascular Medicine. 11th ed. Philadelphia, PA: Elsevier Saunders; 2019:chap 44. US Preventive Services Task Force. Final recommendation statement: statin use for the primary prevention of cardiovascular disease in adults: preventive medication. November 2016. Accessed March 20, 2018. www.uspreventiveservicestaskforce.org/Page/Document/RecommendationStatementFinal/statin-use-in-adults-preventive-medication1. Whelton PK, Carey RM, Aronow WS, et al. 2017 ACC/AHA/AAPA/ABC/ACPM/AGS/APhA/ASH/ASPC/NMA/PCNA guideline for the prevention, detection, evaluation, and management of high blood pressure in adults: a report of the American College of Cardiology/American Heart Association Task Force on Clinical Practice Guidelines. J Am Coll Cardiol. 2018;71(19):2199-2269. PMID: 2914653 www.ncbi.nlm.nih.gov/pubmed/29146533. Atherosclerosis is a disease of the arteries in which fatty material and plaque are deposited in the wall of an artery, resulting in narrowing of the arterial lumen and eventual impairment of blood flow. 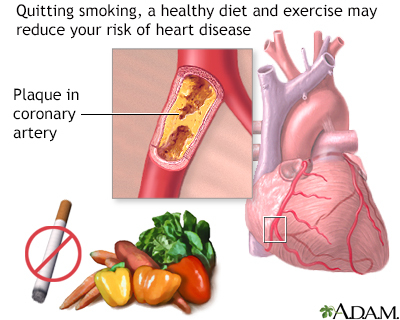 Heart disease may be prevented by recommended healthy diet, regular exercise and to stop smoking if you are a smoker. Follow your health care provider's recommendations for treatment and prevention of heart disease.